The two brands are combining their strengths to bring to life real, meaningful IoT products. Haier and GE Appliances are the world’s largest appliance company and jointly, they are transforming the way consumers interact with their homes. Together, Haier and GE Appliances are the world’s largest appliance company and jointly, they are transforming the way consumers interact with their homes. Focused on creating a “Smarter Home, Better Life,” the two brands are combining their strengths to bring to life real, meaningful IoT products that save time and create opportunities for consumers to connect with their homes—and each other. Those innovations will be featured during the 2019 Consumer Electronics Show (CES) in the Las Vegas. GE Appliances is the pioneer of many industry-first technologies. The company has the largest suite of smart home appliances, with more than 300 connected models and partnerships with tech brands including Amazon, Google, Apple and Nest. Haier’s U+ platform—the foundation for GE Appliances and Haier connected technologies—makes seamless, whole-home experiences possible. Connected service enhances appliance performance and fosters peace of mind for users. It also helps extend the life of products through reminders, software enhancements and capabilities like remote diagnostics. At CES, GE Appliances and Haier will showcase their collective breadth of smart home products that save time on common tasks like planning and preparing meals, reordering household items, rewashing forgotten clothes and more. And for the whole home, Haier is focused on solutions that promote healthier eating, cleaner air and enhanced convenience and connectivity throughout the home. GE Appliances Kitchen Hub. The first-of-its-kind smart Kitchen Hub helps consumers improve cooking skills with thousands of proven recipes and guided cooking; manage daily tasks, including calendars and shopping lists; and connect with friends and family through live video chat. And because it’s built on the U+ Connect platform, consumers can also do things like tap into their favorite music and movies or control lighting and temperatures—all with hands-free control through the Google Assistant. Doubling as an exhaust hood above the range and faced with this unique, smart screen, the Kitchen Hub puts everyday tasks at eye level, eliminating the need to reach for your phone while you cook. GE Profile Countertop Microwave with Scan-to-Cook Technology. Compatible with Amazon Alexa and soon to be compatible with the Google Assistant, GE Appliances’ scan-to-cook technology ensures perfectly prepared food by connecting with a smartphone to scan barcodes on food packaging and automatically send the microwave precise instructions for cooking times and power levels. Café Guided Gourmet Cooking. Developed through a collaboration between GE Appliances and Hestan Smart Cooking, the latest Café induction cooktops and ranges feature Hestan Cue, an app-guided cooking system with temperature-sensing smart cookware that automatically adjusts the pan temperature as users progress through video-guided recipes. Casarte Washing Machine. The Casarte washing machine reads the RFID tag on clothing, QR codes on detergent and recognizes the washer’s location to determine water quality to adjust the amount of water, water temperature, amount of detergent, cycle and rinse for the perfect wash.
Haier Vertical Air Conditioner. The industry’s first fresh-air, self-cleaning air conditioner. Smart technology allows two levels of air volume for maximum comfort—high volume near the head and low volume for less-cool air around the feet—while smart ventilation allows users to continue to enjoy fresh air while the unit is running. The Forge. The newest specialty innovation from FirstBuild, a global co-creation community backed by GE Appliances, the Forge produces impeccable ice spheres in an accessible, compact design that was created for use by professional bartenders and mixologists—or even the home connoisseur—for a sophisticated bourbon or cocktail experience. Haier Footwear Care Solutions. 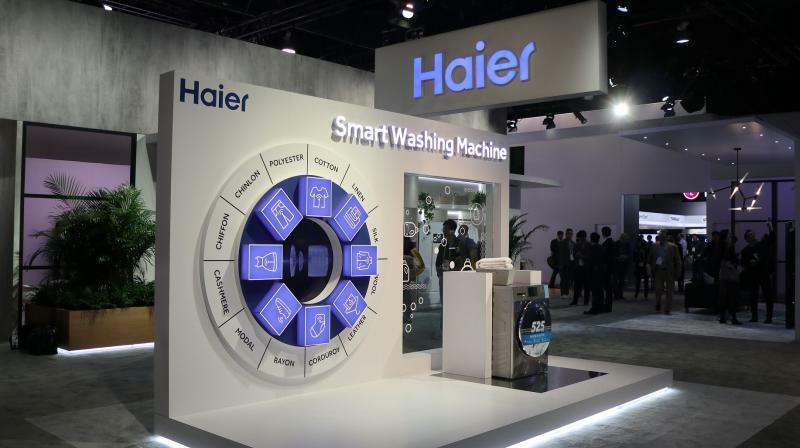 New Haier specialty shoe solutions, including a shoe washer, smart shoe cabinet and smart shoe bag, solve a common problem for consumers: the desire for clean footwear but the reluctance to use the traditional washing machine to launder shoes. Haier Smart Wine Cooler. Haier will unveil a prototype for the world’s first IoT-enabled wine cooler. Leveraging data about more than 800,000 different wines from around the world, the cooler’s smart screen provides users with information about wines, improving their wine knowledge and providing the insight needed to perfectly pair wines with any cuisine. The cooler also allows you to purchase wine directly from more than 100 wineries. Alexa/Dash Replenishment Service: Alexa virtual voice assistant and Dash Replenishment Service are core features on a number of GE Appliances connected ovens, dishwashers, washers and dryers. Drop: The partnership between GE Appliances and Drop brings a layer of intelligence to GE Appliances’ connected ovens. Home cooks can preheat and control connected wall ovens from recipes within the Drop Recipes app, as well as choose from and bring to life more than 500 recipes enabled by the Drop platform right from their kitchens. Google: GE Appliances connected products work with the Google Assistant to take connected refrigerators, ovens and ranges, microwaves, vent hoods, dishwashers, washers, dryers and room air conditioners to the next level with hands-free voice controls. The partnership also brings related notifications direct to mobile devices or through GE Appliances apps. Hestan Smart Cooking: Through a partnership between two culinary IoT leaders, GE Appliances’ new line of Café appliances includes cooktops and ranges with HestanCue, an app-guided cooking system with temperature-sensing smart cookware that automatically adjusts the pan temperature as users progress through video-guided recipes. Innit: GE Appliances and Innit partner to enable adaptive cook programs that are tailored specifically to the connected appliance and the food, enabling restaurant-quality results—with a single click—for home cooks of all skill levels.